However we could accept developments such as these as an important impulse if we are able to perceive our suffering from a mental distance and accept our powerlessness being the observer instead of the victim. Because of this change in perspective a mental freedom arises in which it is possible to perceive alternatives and new challenges to be developed. How effective a relaxed attitude and alert observation can be, we learn from the crocodile. This reptile is lying quietly and relaxed in the water. Although he is strong, he is also powerless in a certain way. His habitat is the river; he can only be silent and watchful wait until maybe an antelope crosses his river. The crocodile never knows when this will happen. He can only wait endlessly and carefully so that it can act at the right moment. As humans we live figuratively in the same circumstances. The river of life comes to us in unexpected waves of opportunities. It is up to us to perceive these and wait for the right moment to act. Our thinking capacity limits our perception. 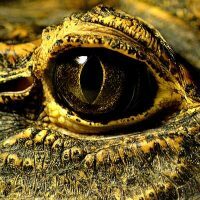 If we look at the crocodile as a metaphor we realize that he does not think. He is relaxed attentive and silent. Silence helps us to perceive with our whole body and all our senses. Only then we will be able to see from a relaxed pose new challenges that come to us, and take our chance.